In just a few months, Apple’s iPad has established that there is indeed a consumer market for a multitouch tablet computer. The 1.5-pound slate with a 10-inch screen has already sold more than 3 million units, even though it costs $499 for the cheapest model, surprising many analysts. And Apple (AAPL) says over 20,000 third-party apps have been written especially for the iPad’s large screen and features, in addition to the more than 200,000 iPhone apps it can also run. As a result, other companies, big and small, are racing to produce multitouch tablets that go beyond the narrow functions of e-readers such as Amazon’s (AMZN) Kindle. Like the iPad, they are meant for a wide variety of uses, including Web surfing, social networking, email, games, productivity, navigation, book reading, and playing music and videos. And, like the iPad, they will pose a threat to the primacy of the laptop for portable computing, and especially to the smallest laptops, the netbooks. This week, a second big computer company, Dell (DELL), is joining the new tablet war in the U.S. But Dell’s first offering in the category, called the Streak—first introduced in the U.K.—is very different from the iPad, and somewhat peculiar. It’s much smaller—with just a 5-inch screen—and makes cellular voice calls, something the iPad can’t do. It is really a tweener device, a design compromise. Depending on how you use it, the Streak can be considered a giant smartphone or a minitablet. Dell is positioning it as a tablet, but, to me, it’s more of a very large smartphone, but one that, for many, will be too large to carry around comfortably. Depending on how you buy it, the Streak can cost either less or more than the base $499 iPad. It goes on sale Aug. 13 at $300 if you sign up for a new two-year AT&T (T) contract, which must include a data plan. (The cheapest iPad with cellular data connectivity is $629.) Or, you can get a Streak for $550 without an AT&T contract. Dell says neither U.S. version can be used with any other phone carrier, though the $550 model can be used as a Wi-Fi-only device, just like the $499 iPad. 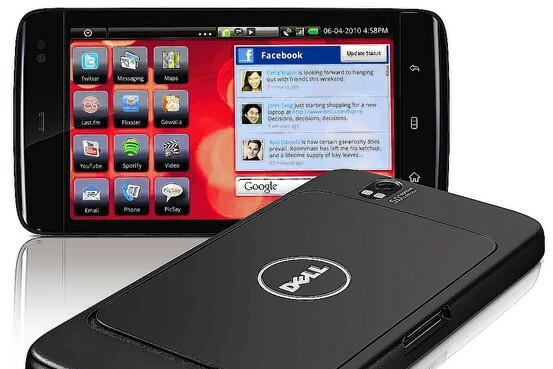 Dell’s Streak runs on Google’s Android operating system, with access to some 70,000 thirdparty apps available in the Android Market store. The Streak will be available only through Dell’s website, not at any stores, not even AT&T’s. The Streak runs on Google’s (GOOG) Android operating system, and has access to the 70,000 or so third-party apps available in the Android Market app store. But I couldn’t find, and Dell couldn’t identify, any apps written especially for its larger screen. In fact, a few Android apps I tested seemed to crowd all their icons into just a portion of the Streak’s screen, especially when the device was held vertically, leaving lots of white space. The Streak’s 5-inch screen is much larger than the iPhone’s 3.5-inch display, or the 3.2-inch screen on the new BlackBerry Torch. But it didn’t feel radically larger to me than the 4.3-inch display on some of the newer Android smartphones, such as the HTC EVO, which, while bulky for a phone, is still much easier to fit in a pocket than the Streak is. The Streak is a long, skinny device. It’s 6 inches long and 3.11 inches wide, about a fourth the footprint of the iPad, which isn’t meant to go in a pocket, but considerably longer and somewhat wider than the EVO, which is. It’s much lighter than the iPad, at just under half a pound, but heavier than many smartphones. In my tests, I found I could carry the Streak comfortably in the pocket of loose jeans, or in a suit jacket’s inner pocket, but not in a shirt pocket or the pocket of more fitted pants. It would take up a lot of room in a small or medium-size woman’s handbag. And it looks somewhat ridiculous when held up to the ear to make a phone call. Also, the Streak comes with the outdated 1.6 version of Android, though Dell says it will eventually be upgradeable to the latest edition. In my tests, the Streak delivered both moments of pleasure and moments of frustration. When held horizontally, the screen felt luxurious, with lots of room, and good sharpness and color, for playing video or viewing photos. Even in portrait mode, reading books using the Amazon Kindle app was a much better experience than on any smartphone I’ve tested, though not nearly as good as on the iPad or Kindle e-reader. The screen also holds plenty of app icons and more large widgets than other Android phones I’ve tested. And there are convenient bars at the top for quickly checking notifications, adjusting wireless settings, managing screens and accessing apps that aren’t on the main screens. The Streak also has generous memory for an Android phone. It comes with 19 gigabytes of total memory, including a removable 16 gigabyte memory card. Two gigabytes of the internal memory can be used to store apps—excellent for an Android phone, but much less than on the iPad. Its 5-megapixel rear camera took sharp photos and fair videos, and phone calls sounded clear. The large screen was a big plus for Google’s free voice-prompted navigation app. Battery life was very good, easily lasting a full day, and the battery is removable. But the Streak also crashed on me several times. On one occasion, it started vibrating endlessly, only stopping when I removed and replaced the battery. The device has a front-facing camera—unlike the iPad, which has no camera at all. But video calling isn’t integrated, unlike on the new iPhone, and requires you to sign up for a third-party service. Twice the device proclaimed it couldn’t find the memory card and had to be restarted before it could. Twice, the YouTube app failed to load any content. Also, the buttons on the top edge for turning the Streak on and off and for taking pictures are very close together and easily confused for each other. And the camera button eventually stopped working for me altogether. The speaker, located on the back, sounded tinny when playing music. And it was too easy to block the rear camera with a thumb or finger when holding the Streak naturally. Find Walt Mossberg’s columns and videos at the All Things Digital Web site, walt.allthingsd.com. Email him at mossberg@wsj.com.